Land cover changes, carbon storages and Fires 2002 in Kalteng, Strapeat-Seminar / Workshop in Palangkaraya and Workshop in BPPT, Jakarta on 30.11.2004 Introduction PSF is among the earth's most endangered ecosystem with a huge carbon storage capacity, extremely fragile to disturbance (Sieffermann 1988 and Rieley et al. 1996). Between 1999 and 2003 three Landsat images from Sampit and Palangkanbun area were compared using detailed multi-temporal analysis (see Fig. 1 and 2 and Tables 1 and 2). Ground verification tracks were done in Nov. 2003. 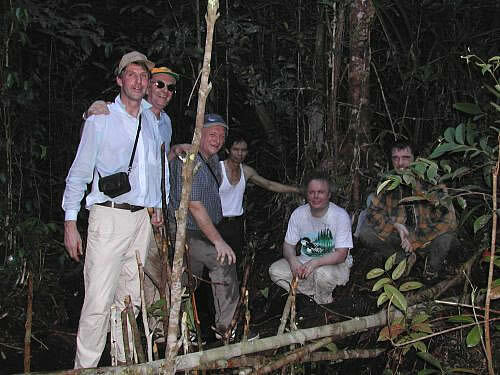 During the last 10 years big plantations of oil palm and rubber trees were planted on peatland. Oil palm on fragile peat soils have excellent fruit yields with careful water management. Establishment costs are high, as the peats require compaction prior to planting as well as drainage / irrigation. World demand for palm oil is forecast to increase from 20.2 million tonnes per annum to 40 million tonnes in 2020. If this demand is to be met, 300 000 ha of new estates will need to be planted each year (Sargeant, 2001). Initial fire set to clear residual wood debris, continues to smoulder and emits dense smoke from peat underground long after the surface fire has died (Page et al. 2002, Usup et al. 2004). Indonesian law explicitly forbids the use of fire for land clearance. Haze and fire monitoring over Borneo and Sumatra using NOAA satellite images offers the Singapore National Environment Agency service for new fires on a daily basis: http://app.nea.gov.sg/cms/htdocs/category_sub.asp?cid=55 . Hot spots are counted in the images. In 1996 the Indonesian Government commenced the “One Million Hectare Mega Rice Project” (MRP), linked to transmigration (Barber and Schweithelm 2000, Boehm et al. 2000, 2001). The 1.5 million hectares total area affected by this project was divided for operational purposes into five landscape units known as blocks A, B, C, D and E. Block D was opened before 1996. The division of block E into E, E2, E3 and E4 is caused by the rivers Kahayan, Mangkutup, Muru, Kapuas and Barito. The MRP is a major location of fire “hot spots”, especially in the dry season. Between July to November 2002, during a minimum ENSO five years after the big ENSO of 1997 strong fires damaged many regions around Palangka Raya (Boehm et al. 2003a, 2003b, 2003c). Detailed analysis was made for the different MRP blocks. Burned peat below the vegetation released large amounts of carbon (Page et al. 2000, 2002, Siegert et al. 2001). Pak Suwido Limin from University of Palangkaraya and director of CIMTROP writes on the 29. 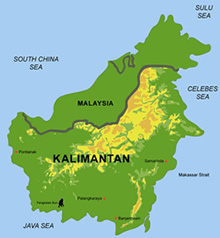 July 2002: “CENTRAL KALIMANTAN IS ON FIRE AGAIN! A PLEA FOR URGENT ASSISTANCE! A fire fighting team, ‘Tim Serbu Api’ (TSA) under my direction is working hard to suppress fires in block C of the former Mega Rice Project area, near to the Kalampangan Channel in Central Kalimantan Province of Indonesia.